In times of climate change and scarce resources, it is essential to reduce emissions and to use fuel as economically as possible. Naturally, the transportation sector has a high-energy demand and uses a great deal of the resources, which account for high carbon dioxide emissions. Prudent use of public-transport (PT) vehicles can help make the need for travel more economical, thus saving resources. 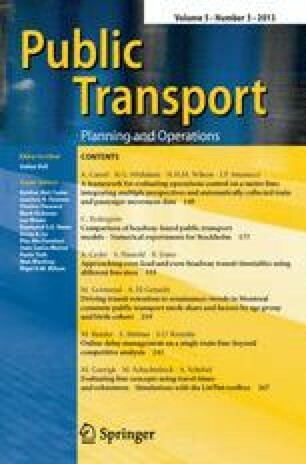 This work proposes a multi-objective methodology to create bus timetables using multiple vehicle sizes, and has two objectives carried out simultaneously: First, minimize the deviation of the determined headways from a desired even headway and second, minimize the deviation of the observed passenger loads from a desired even-load level of the vehicles at the maximum-load point. The first objective will reduce the expected waiting time of randomly arriving passengers and thus will increase the attractiveness of the PT service. The second objective will improve the reliability of operation for fluctuating demand, and will improve the utilization of the vehicles from the operator perspective. The suggested methodology uses a graphical heuristic approach to examine different strategies in the creation of the optimal timetables. The methodology developed is applied to a case study of a bus line in Auckland, New Zealand.